Based in Conran Design Group’s London office, Lee Hoddy oversees a diverse creative team of 25, who work on some of the world’s most recognised brands such as Shell, DeBeers, AstraZeneca and Burberry. He is responsible for maintaining the highest standards of creativity across all client projects and disciplines. Working closely with CEO Thom Newton, Lee drives creative standards, the growth strategy and the reputation of the business. He builds collaborative working relationships internally and with his clients, using design as a catalyst to inspire, empower and drive transformative solutions. As part of his network responsibilities, Lee is a member of the creative steering team at Havas UK, working collectively and collaboratively with sister agency creative heads promoting quality standards across the group. Passionate about ideas and work that is communications led, Lee champions creativity that has a purpose and makes a difference both creatively and commercially. 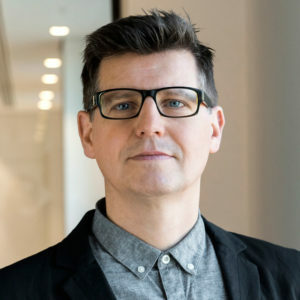 Lee founded branding specialists 35 Communications with Thom Newton in 2003, which later merged with Havas-owned Conran Design Group in 2008. Lee has worked in the design industry for over 20 years, honing his experience at leading creative agencies including SampsonTyrell (now Brand Union), BamberForsyth, and Fitch, a career path which provided him with rounded experience, multiple influences and a creative style that encourages participation. Lee is committed to driving powerful brand experiences to create meaningful connections between brands and people.